A North Carolina food processor has recalled more than 17.7 tons of ground beef, some sold in Kroger stores, for possible contamination with plastic bits, according to the U.S. Department of Agriculture. JBS USA, Inc., is recalling 35,464 pounds of raw ground beef processed at its Lenoir, N.C., facility for possible contamination with hard plastic pieces, the USDA's Food Safety and Inspection Service announced late Wednesday. The recall comes after a consumer found blue, hard plastic pieces in one of the products, the USDA says. The department says there have been no confirmed reports of adverse reactions due to the consumption of the products, which were produced March 22, 2018. The ground beef, sold in a variety of packages, were shipped to distribution centers in Virginia and Indiana and sent to retailers including Kroger stores in North Carolina, Virginia, Indiana, Illinois and eastern West Virginia, as well as Food 4 Less and Jay C stores in the Midwest. The products carry a sell-by date of April 9, 2018 and a USDA mark with the number EST. 34176. Among the products recalled are 1-pound and 3-pound trays of "Kroger Ground Beef 80% Lean-20% Fat," as well as 3-pound trays of "Kroger Ground Beef 73% Lean-27% Fat." 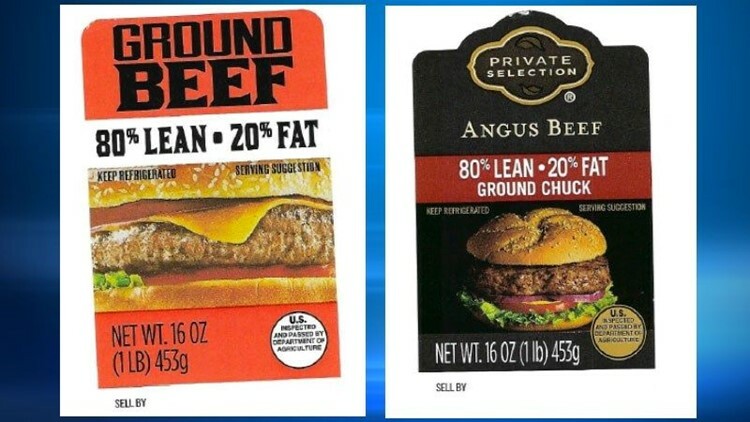 Other 1-pound packages are labeled "All Natural Laura’s Lean Beef with 92% Lean-8% Fat Ground Beef" and All Natural Laura’s Lean Beef with 96% Lean-4% Fat Ground Beef," "Private Selection Angus Beef 80% Lean — 20% Fat Ground Chuck," and Private Selection Angus Beef 90% Lean — 10% Fat Ground Sirloin." Also recalled: 15-pound cases labeled "JBS Ground Beef Angus Chuck 80% Lean 20% Fat” and “Ground Beef Angus Sirloin 90% Lean 10% Fat." Kroger is aware of the recall and has "verified that none of these products are in our stores today," spokesperson Kristal Howard said, "We encourage customers to check their freezers for the potentially affected products and not to consume them but throw them away or return them to their place of purchase for a full refund." Kroger’s Mid-Atlantic division, which has stores in North Carolina, eastern West Virginia and Virginia, received some shipments of the potentially-affected products, she said. Kroger stores in Indiana and Illinois -- and Food 4 Less and Jay C stores in the Midwest -- got just limited amounts of the 80/20 ground beef in 1-pound and 3-pound packages, Howard said.